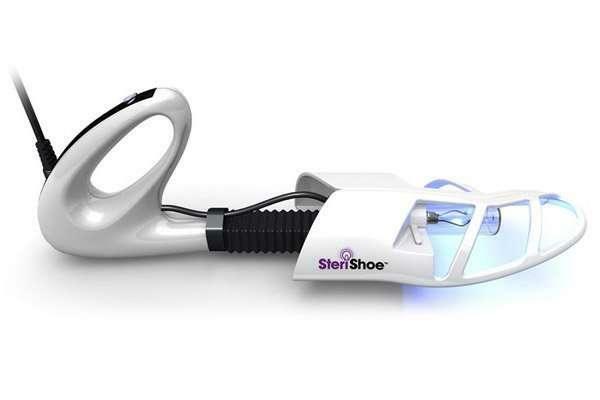 Steri Shoe is a patented shoe sanitizer that uses germicidal ultraviolet light (UVC) to sanitize the inside of shoes. Steri Shoe safely and effectively kills 99.9% of the bacteria, fungi, and spores in shoes that cause athlete’s foot, toenail fungus, and shoe odor. For people with diabetic foot problems, the insert can guard against infection. Because human feet sweat up to eight ounces of moisture a day, shoes can be breeding grounds for fungus, bacteria, and spores. Sometimes those microbes can produce a foul odor, and other times, those microbes can cause infections like toenail fungus or athletes foot. And for people who have diabetes, foot infections can sometimes lead to amputation. The Steri Shoe keeps feet clean and healthy by getting by killing the bacteria, fungus, and spores that cause odor or infection in shoes. It can be used as part of a complete treatment program or as a preventive measure to keep shoes clean and maintain healthy feet. How Does Steri Shoe Sanitize Shoes and Prevent Infection? A Steri Shoe sanitizer is inserted into shoes just like normal shoe trees. After pressing a button, the insert emits a germicidal UVC light that is clinically proven to kill bacteria, fungus, and spores. The sanitizer runs a 45 minute treatment cycle that destroys up to 99.9% of the harmful microbes that lead to odor and infection. In order to prevent people from being exposed to UVC light, the SteriShoe uses a combination of compression and light sensors. The sanitizer must be inserted and compressed in a shoe in order to operate. Also, the light sensor must detect a dark environment before beginning the 45 minute cycle. The UVC light will not begin working unless the insert is compressed and in a dark environment. Each Steri Shoe comes with a bag that can be used to create a safe dark environment for sandals and open toed shoes to be cleaned. American Foot & Leg Specialists is a full-service practice that includes shoe products like the Steri Shoe Sanitizer Insert to meet the special foot needs of our patients. American Foot serves patients in south metro Atlanta and cities farther southward like Jonesboro, Fairburn, Senoia, and Union City. Call today to have your foot problems diagnosed and visit our Foot Care Center.